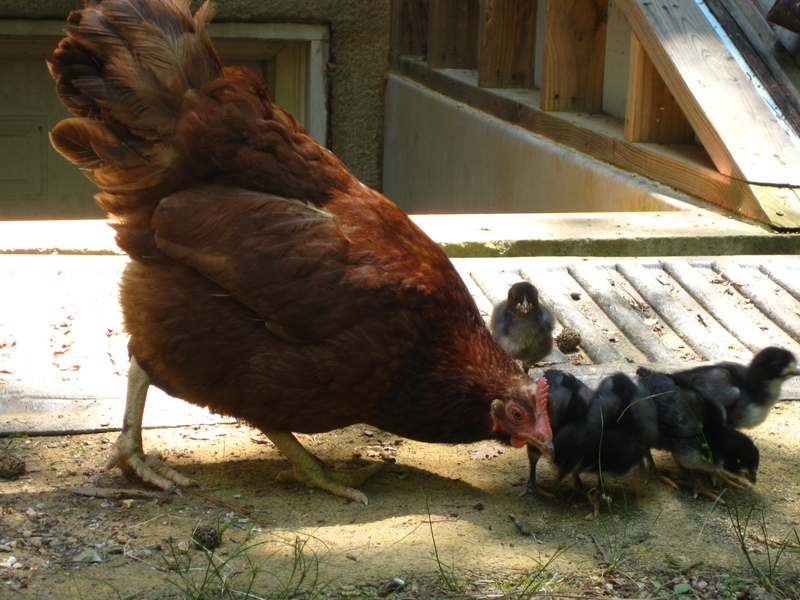 In a recent post, we announced the potential arrival of baby chicks after one of our hens decided to brood over the eggs she had laid under our porch. Of the dozen eggs she determinedly sat upon for a couple of weeks, 6 hatched! We lost one early on, but have been delighted by Momma Flo Jo getting her wish for lil’uns and 5 very curious chicks dancing around our house. The family of 6 now have their own living space under our porch. Flo Jo leads them off every morning to teach them how to scratch into the ground and forage for food. They happily jog behind her, sometimes even riding on her back! In a time when we periodically suffer losses in our flock to predators, we have been given quite a gift to unexpectedly receive 5 new chicks and witness the beauty of life, growth, and motherhood.